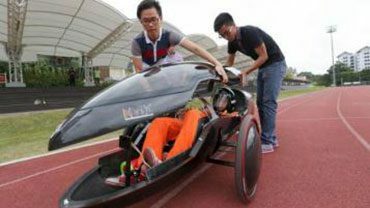 Nanyang Technological University (NTU) students have built Singapore’s first urban solar electric car with an innovative 3D-printed body shell that has 150 parts. Mounted on a carbon fibre single shell chassis, the NTU Venture (NV) 8 will race in the Urban Concept category at this year’s Shell Eco-marathon Asia. “We are extremely proud to have designed and assembled a 3D printed body shell for the electric car, which is Singapore’s first and probably Asia’s first 3D-printed concept car,” said Associate Professor Ng Heong Wah.